“Tips and tricks for iOS7” is a way to discover all the iOS7 features. 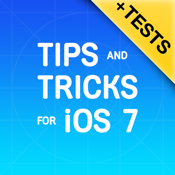 “Tips and tricks for iOS7” is created especially for those who wish to start using an iPhone for 100%, knowing about all the features available on iOS7. Every feature is described in details and screenshots are to help users not to get confused in a big volume of information. App contains many useful tips of how to manage the device and control its features with a minimal number of actions performed. User-friendly interface allows you to have no difficulties in usage and easily swap between tips. You can save any page in “Favorites” to reach it any time you need it, without surfing the app. Or you can share it with friends to make them aware of something, you think is going to be useful for them too. App will help you to discover your iPhone from A to Z, including the hidden features, never described in manuals. In addition, you can check the knowledge you have got by taking tests. 5 levels tests of different complexity allow you to see how well you know your favorite gadget. •New “Control Center”, “Camera”, “Blocked Contacts” and other features description. Be the first to discover all the cool iOS7 features! Test your knowledge, share it with friends and use your iPhone for 100%, making the usage easy and handy!